Wondering how on earth soldiers eras past managed, we eased ourselves up through the narrow winding staircase of the bastion, and were rewarded by sweeping vista views of the Atlantic and Cumberland Sound. Ramparts, barracks, and long dark tunnels, this was a Florida fort we could freely climb through to explore the past. 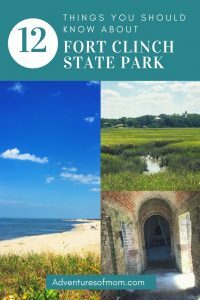 Named after American Revolution & Seminole War veteran General Duncan Lamont Clinch, and located on the northern portion of Amelia Island, this 1,427-acre Florida State Park offers a step back in time behind the red brick masonry walls of historic Fort Clinch with hiking and biking, swimming and fishing and much more. 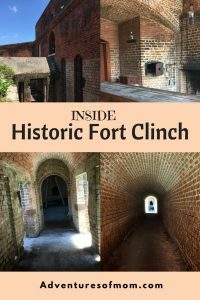 Here are 12 things you should know about the historic Fort Clinch State Park. You can see Georgia from the this Florida State Park. Stand on the ramparts or even on the beach along Cumberland Sound and you have a clear view of Georgia. On a very good day you may even see the wild horses of Georgia’s Cumberland Island National Seashore. Fort Clinch was never finished. This northern Florida fortification was in a constant state of being built and as a result, was never actually finished. You can see the layout of the barracks-to-be in the courtyard and may notice the places along the inner battlement walls where there are fireplaces, waiting for rooms to warm. Although it’s in the south, the Union Army held this fort. During the Civil War, the Confederates in Fort Clinch only had a brief stay in 1861, before General Robert E. Lee ordered their withdrawl. Fort Clinch was taken over by the Union Army and used as a base for operations during the remainder of the Civil War. Franklin D. Roosevelt aided in the Fort Clinch restoration. In the early 1930’s, President Franklin D. Roosevelt formed the Civilian Conservation Corps, which provided laboring jobs, to young, able-bodied men during the depression to help restore and develop many parts of rural America. The CCC helped to restore the masonry fortifications of Fort Clinch, among many of their other admirable works. Fort Clinch became one of Florida’s first state parks. Fort Clinch State Park opened to the public in 1938. The park closed during World War II, to guard against wartime threats, and being the East coast, there was (we discovered a sea mine hull on a beach south of Fort Clinch, a testament to the coast’s history). You may be put to work by a Union Soldier at Fort Clinch. If you show up on the first weekend of the month, the fort springs to life with reenactment soldiers, who take their parts seriously and offer up a vivid picture of what life in the fort was like during Civil War times. The Fishing Pier is closed permanently. Last summer’s hurricane Matthew swept up the coast, flooding St. Augustine and leaving damage in it’s wake. Though most places have fully recovered, the fishing pier at Fort Clinch State Park faced irrepairable damages and is closed indefinitely. They have plans to tear it down completely. You can still fish along the beaches though. Fort Clinch State Park has 3 miles of coastline, but be aware of the strong riptide. So while it’s a good place to look for seashells and sharks teeth- maybe even pirate gold, as Blackbeard was known to hang in Cumberland Sound (though no one has found any gold to date- still looking! ), the currents in the area are strong. There are no lifeguards on duty there either, so watch the kiddies. There’s a 6-mile bike trail. This bike trail takes you up and down, in a challenging natural course through the State Park. You can hike it as well. You are bound to see wildlife on the Willow Pond Nature Trail. Take the shorter 25 minute stroll on the Willow Loop or the more challenging longer Magnolia Loop through the coastal hammocks and past green swamps. Deer and alligator sightings are common on these trails- there’s even a gator warning sign. We had a little faun hop across the trail right in front of us and saw a doe further down the trail. You can camp! Though the camp sites are not directly on the beach, there are two areas of campsites in Fort Clinch- Atlantic side and the Amelia River side. You can see Amelia Island Lighthouse from Fort Clinch State Park. Stop at the Egans Creek Overlook. It’s a short walk and boardwalk overlook of the salt marsh and Amelia Island Lighthouse. Fees: $6 a carload for 2 to 8 persons(or $2 per person). 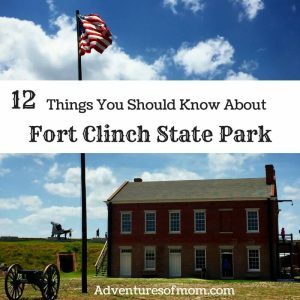 Extra entry fee to explore the fort is $2 per person. Fort Clinch was under restoration during our visit. Being a historic fortification (listed on the National Register of Historic Places) and battered by hurricanes, it is undoubtably always in a state of restoration. When visiting, take heed to any warnings or baracades. They were put there for good reasons. There are no handrails or guardrails, so watch your younger kids while exploring this significant piece of Florida history.